Sevottam Model is a model proposed by 2nd ARC (Administrative Reforms Commission) for public Service Delivery. The word, Sevottam, is a combination of two Hindi words: ‘Seva’ (service) and ‘Uttam’ (excellence). Sevottam Model is now regarded as a standard model for providing services in citizen centric governance. The model is developed by rectifying the drawbacks in the earlier mechanisms of public service delivery like Citizen Charters (CC), and is gradually adopted by various departments under Central and State government. What is sevottam model, to be precise? Sevottam model, a quality management framework applicable to public service delivery organisations, in all its departments. Service Delivery Excellence Model provides a framework for organisations to assess and improve the quality of service delivery to citizens. Define services and identify clients. Set standards and norms for each service. Develop capability to meet the set standards. Perform to achieve the standards. Monitor performance against the set standards. Evaluate impact through an independent mechanism. Continuous improvement based on monitoring and evaluation. 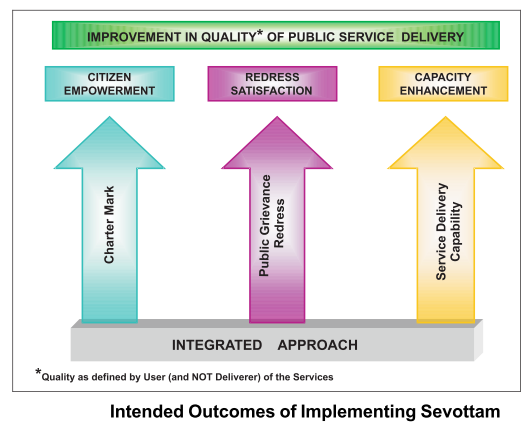 Sevottam model provides a standard for providing public service delivery in a citizen centric administration. Those organisations adopting Sevottam model for service delivery needs to comply the 7 steps and ensure the formulation of 3 modules. Indian Standard IS:15700:2005 formulated on basis of Sevottam. Improve the quality of public service delivery in the country. Intermediate outcomes are expected from compliance of conditions designed for each of these three components. These include Citizen Empowerment, Redress Satisfaction and Capacity Enhancement. Prepared without involvement of citizens/clients/stakeholders. No relation with service delivery improvement. Information about charter does not percolate down the line, hence not implemented. Not in place in many organizations. Grievances not taken as feedback for improvement of services. Employees not trained for improvement of tasks assigned. Not prescribed or not met due to inadequate infrastructure. Non involvement ,de-motivation and lack of training of employees at the cutting edge level. Lack of proper planning for optimum utilization of resources.